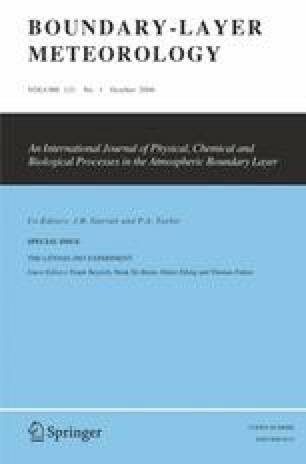 Different aspects of the quality assurance and quality control (QA/QC) of micrometeorological measurements were combined to create a comprehensive algorithm which was then applied to experimental data from LITFASS-2003 (Lindenberg Inhomogeneous Terrain—Fluxes between Atmosphere and Surface: a long term Study). Eddy-covariance measurements of the latent heat flux were the main focus of the QA/QC efforts. The results of a turbulence sensor intercomparison experiment showed deviations between the different eddy-covariance systems on the order of 15%, or less than 30 W m−2, for the latent heat flux and 5%, or less than 10 W m−2, for the sensible heat flux. In order to avoid uncertainties due to the post-processing of turbulence data, a comprehensive software package was used for the analysis of experimental data from LITFASS-2003, including all necessary procedures for corrections and quality control. An overview of the quality test results shows that for most of the days more than 80% of the available latent heat flux data are of high quality so long as there are no instrumental problems. The representativeness of a flux value for the target land-use type was analysed using a stochastic footprint model. Different methods to calculate soil heat fluxes at the surface are discussed and a sensitivity analysis is conducted to select the most robust method for LITFASS-2003. The lack of energy balance closure, which was found for LITFASS-2003, can probably be attributed to the presence of low-frequency flux contributions that cannot be resolved with an averaging time of 30 min. Though the QA/QC system has been developed for the requirements of LITFASS-2003, it can also be applied to other experiments dealing with similar objectives.